This was sent along within a private email discussion that's been going on for a few months about car sharing. 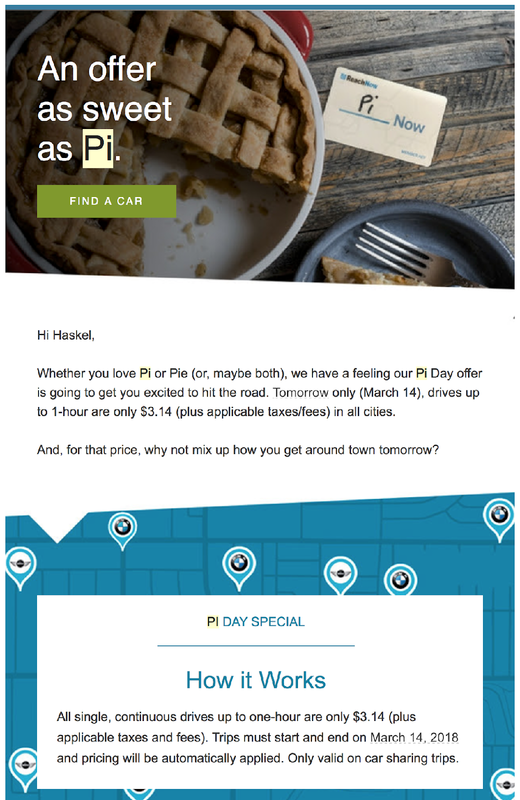 Yesterday, "Pi Day," BMW Reach Now, the car sharing service, did a promotion on "Pi Day"--March 14th--charging only $3.14 per hour to use a car. Except for the fact that Pi Day is in March, which isn't the most temperate of months, a special rate on Pi Day would be a great promotion for an all day bike share pass too, as a way to get people to try it out. It should be positioned as a membership development promotion, and only open to people living in resident zip codes (the idea being, through taxes they pay they are paying towards the city/county expenditures on bike share anyway).